Make the Most Out of Your Trip to Rollerland! We at Rollerland Skate Center are proud to be Fort Collin’s roller rink of choice. After all, Rollerland is the place where good times roll! But we are more than a roller skating rink. We also have great food, a fun arcade, a challenging laser maze, and a 3-level indoor playground for little ones. Bring friends: playing at Rollerland is always more fun with friends and family! You don’t have to plan a big party to have a good time. Send your friends an impromptu invite and enjoy a day of skating! Come hungry: our concession area features tasty food and snacks so you don’t have to worry about leaving to eat! Bring your friends together for a delicious lunch or dinner and then get back to the FUN! 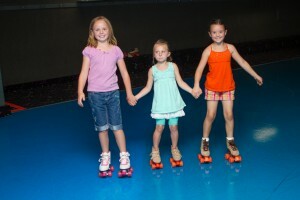 Rollerland Skate Center is located at 324 South Link Lane Fort Collins, CO 80524. We look forward to seeing you at our rink!